Purchased from the Beriah Botfield collection at Norton Hall, Northamptonshire, with the aid of the National Art Collections Fund, 1942. (Norton Hall No. 21). Swept hilt of bright steel of Norman (1980) type 57 with inner guard of Norman (1980) type 30, originally blued. The hilt consists of pommel of Norman (1980) type 32; a knuckle-guard and a rear quillon (curved towards the blade and with a disc terminal) which support arms with a side-ring on their ends outside the hand; a second side-ring near the ends of the arms is inclined towards the pommel and is linked to the knuckle-guard by a short loop-guard; inside the hand a long loop-guard links the knuckle-guard to the end of the rear arm with two branches each linked to the end of an arm; grip, probably of wood, with modern wire twist binding. Broad, straight, sharply tapering, two-edged blade with narrower ricasso, tapering towards the grip. The sword has clearly been dismantled at some time. In comparison with other examples from the same group (see Notes) the knuckle-guard ends at a point rather nearer the top of pommel. This, together with the modern grip binding (see above), suggests the original grip has been replaced with one that is slightly shorter. On blade, on ricasso, on both sides, stamped: a shield surmounted by a crown, the shield having the letters S over T (drawing in Marks card; mark of Wolfgang Stõndler? - see Notes). For Norman's hilt, inner guard and pommel types see A.V.B. Norman and C.M. 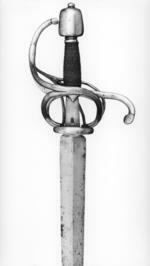 Barne, 'The Rapier and Small-Sword, 1460-1820', London etc., 1980, pp. 127 ff. and 231 ff. The present sword belongs to a well-known group of swords with (originally) blued steel hilts of identical form, examples of which are now scattered through many collections. Some were apparently made to equip a Bavarian Corps, probably the Munich Town Guard (examples in the Bavarian National Museum, Munich are the remnant of about 50 (number given on an anonymous de Cosson index card - see below) formerly in the Bavarian Army Museum, from which a number were disposed of by exchange beteween the wars. Others are in the Berlin Zeughaus and the Salzburg Museum (the same anonymous de Cosson index card). Ohters, probably for the Brussels Town Guard, were in the Porte de Hal collection, now in the Musée de l'Armée, Brussels (25 according to the same anonymous de Cosson index card); 18 were on display seen by PJL, 09/04/91): the latter group at least all seem to have the same mark as on the present sword (PJL]. This information is drawn from Norman and Barne 1980, p. 128; J.G. Mann, 'Wallace Collection Catalogues: European Arms and Armour', 2 vols, London, 1962, II, pp. 309-10, no. A612 (an example of this type with the same ST mark); A.V.B. Norman, 'Wallace Collection Catalogues: European Arms and Armour Supplement', London, 1986, p. 140, no. A612; and an anonymous card in the de Cooson card index (photocopy on inv. file). The typed inventory states that the mark is that of Wolfgang Stõndler (anglicised to Stantler). Mann (1962) apears to be in no doubt that the mark is his and this view is not modified by Norman (1986). Both the Munich and Brussels groups as well as the mark are discussed in H. St÷cklin, 'Münchner Klingenschmeide' [part IV], 'Zeitschrift für Historische Waffenkunde', VIII, 1918-20, pp. 198-205, at pp. 202-3, Marke 48 and Abb. 5 (this section should be translated to check that the mark is attributed specifically to Wolfgang Stõndler). Swords belonging to this group are too numerous to list individually here but photocopies of published examples noticed will be place on the inv. file. There is a very large colour illustration of a hilt from this group on the dust jacket of M.D. Coe et al., 'Swords and Hilt Weapons', London, 1989 (copy on inv. file); the location is not given but it appears to be the Wallace Collection example (inf. David Edge, July 2001); the sword seems not to be illustrated in the book itself. Another example, in very good excavated condidtion, was left on deposit in July 2001 (B.0212) it had a blade approx. 115 mm longer than IX.769 and shoulder was slightly less rounded, but otherwise it was very close. (See inv. file under present number for further details).